File cabinets are a must-have in any successful office. Without them, you are left trying to properly organize and sort documents and things can get overwhelming very quickly! To help with this, you need the best file cabinet reviews you can find. Well, look no more! After 150 hours of research, testing, and writing, we have created the largest and most informative file cabinet review you will find anywhere. The metrics we used to help make our decisions are: Build Quality, Ease of Use, Styling, Cost, and Overall Rating. 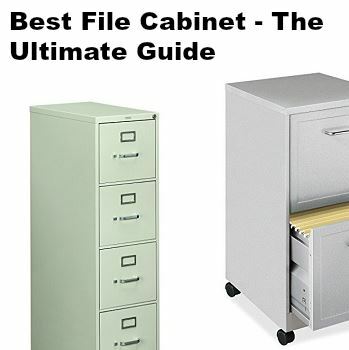 We also lay out some guidelines that you should go through that will help you to determine what the best file cabinet for your needs truly is. But before we get into all of that, we have listed our top 5 choices in the table below. If you wish to read the full reviews for a particular brand, simply click on the link in the Table of Contents or just scroll down. There are a ton of file cabinet companies out there and trying to digest them all can be overwhelming. We have done all of the hard work for you and listed out the top file cabinet brands below. You can click on any link to jump to the full review of that particular brand. 5COU might have a weird name but their selection of file cabinets is huge and cannot be ignored. They appear to be one of the many online companies that deal in a wide variety of product categories (likely importing them) but one of their largest sectors is in office storage supplies. They have both traditional wood-based file cabinets and also more sleek and modern metal examples. They also have many different shapes and sizes. That being said, they seem to be focusing on the higher end of the price spectrum. Alera is another brand that has a huge selection of file cabinets. In addition, they have past documented success in selling their cabinets online with many happy customers. They take a very straightforward approach, working almost exclusively in vertical file cabinets with between 2 and 4 stacked drawers. They also deal mostly in metal but have a few wood options as well. It seems that their target is the business environment as most of their products don’t have a ton of styling and seem to focus on functionality over looks. Altra Furniture is another heavy hitter in the online file cabinet world. They take a somewhat different approach, focusing more on smaller and residential file cabinets that are very affordable rather than huge bulky examples that cost much more. They also have some very stylish designs that really help them to stand out from much of the competition from an aesthetic standpoint. But it does come at the cost of performance and build quality. Bush Furniture brings to the table an attractive lineup of file cabinets that really seem to be targeted for homes or stylized small offices as opposed to large commercial or industrial applications. Their products tend to be very attractive and come in some aesthetically-pleasing materials and colors that will help to set off any room. They seem to also take a “middle of the road” approach in their build-quality and price point. CommClad (sometimes referred to as Hirsch Industries) is another large online company that sells file cabinets. The primary difference between them and many others is that they deal almost exclusively in file cabinets! Because of this, you know that they have a good idea of what it takes to make a successful product. Their main target audience is businesses and professional settings as they don’t offer much in terms of aesthetic examples you would want to decorate your home with. Asking prices are also quite reasonable. DEVAISE sells quite a few items in various product categories. 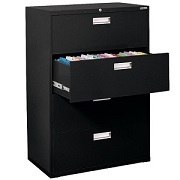 In regards to file cabinets, they have a decently-sized lineup of lower-end examples intended for homes or non-business settings. The lower costs do mean that they aren’t as robust as many of the industrial file cabinets but it also means that they have more flexibility in design and colors as well as a much lower asking price. Fireking is a unique brand in that they make file cabinets that can handle the most extreme conditions. These things include being dropped from 30 feet, having ceilings collapse on them, being water-resistant, and (as the name suggests) being fireproof. So it goes without saying that these are extremely tough products that can easily handle typical wear and tear in an office setting. Their styling is very plain (likely a requirement for them to be so tough) and, as you might expect, they are very expensive. Giantex has a somewhat small but notable lineup of filing cabinets. The first thing you will likely notice about Giantex filing cabinets are their somewhat unique looks, small size, and aggressive price. As you might expect, however, the looks and the good asking price do mean that there are some shortcuts in other departments. These are really targeted at small-scale operations that don’t need a lot of storage space and/or people on a tight office budget. Great Openings certainly has a unique name but it is probably pretty easy to guess what they specialize in when reading it. They deal in all sorts of cabinets (both filing and conventional) and bring to the table some really unique and visually pleasing works. Their quality is on point and they appear to be targeting the higher tier residential markets in the product lineup. Their asking prices are quite expensive, however. HON could be considered an “office superstore” as they sell tons of different types of product geared around properly equipping your home or business office. Following this approach, their lineup of file cabinets attempts to find a happy medium between a home office and professional office in quality, looks, and price. They offer units in various materials, color combos, and sizes. Their asking prices tend to hover around the mid-tier as well. Lorell really is striving to be the end-all brand for file cabinets. They have products for every price point except absolute premium tier and they have enough sizes and styles to appeal to just about everyone. It seems that Lorell’s approach is to find a happy balance between quality and price. You may seem some minor fitment issues but they hope that their competitive asking prices will help make it easier to overlook them. Mayline may not have as big of an online presence as some of the other companies but they still certainly offer some unique traits that are sure to spark people’s attention. They are one of the few brands we have come across that work almost completely in non-conventional file cabinets. Drafting, medical, and many other sectors are one of their huge focuses. If you are after a simple and boring steel file cabinet with little in the way of aesthetic features then you will probably be a bit disappointed. They are also quite expensive but hope that their unique pros will make it worth your while. 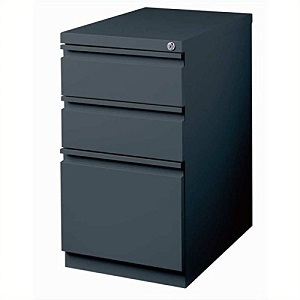 Merax offers up a small pop popular lineup of simple and low-cost metal file cabinets that are primarily targeted at small houses offices. These cabinets almost all have either 2 or 3 drawers and will not have nearly the storage space of much larger, more expensive models. But Merax hopes that their simple design and low-cost approach will strike right at home with many people. Office Dimensions has a very safe and proven approach of delivering conventional and popular file cabinets that seem to be targeted mostly towards passionate home offices or small to mid-sized business settings. 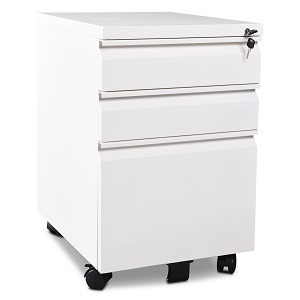 A majority of their products are your typical file cabinet orientation (vertical, stacked drawers, extended handles, metal, etc.) but they do have a handful of more unique products for those that want to break the mold. Their asking prices are about average in the industry. Office Realm deals with anything and everything related to properly furnishing your office. 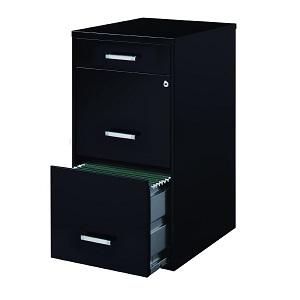 This expands far beyond file cabinets into other areas such as chairs, wire covers, and much more. Their selection of file cabinets is quite large and diverse and should be able to accommodate just about any taste or setting. But it is important to note that they basically sell other brands such as Alera, HON, etc. However, their asking prices are a bit high compared to what else is out there but they hope their quality and reputation will more than justify it. Poppin if another niche brand that we felt was worth checking out because of their unique approach in making file cabinets. 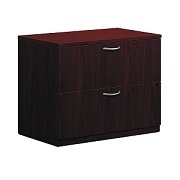 They offer up very small, “cute”, and stylish file cabinets that are perfect for small house or apartment offices. While on the small side, these cabinets have been designed by Poppin to be large enough to hold typical documents you would want to store. Also, Poppin is confident that their manufacturing processes are on point and you will enjoy a high-quality and durable product that will last for many years to come. However, it does come at a rather high asking price. 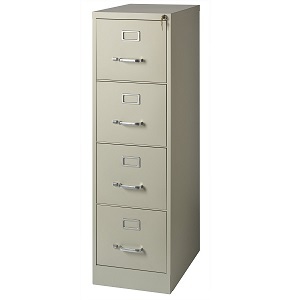 Sandusky has an enormous selection of file cabinets in all sorts of shapes, sizes, and color configurations. They are one of the few companies we have come across that has as big of a selection of 2 and 4-door cabinets as they do 3. Their price point is in the mid to high price range so we do expect a great-performing product that also has loads of storage space. Sauder attempt to class things up a bit with their attractive line of file cabinets. Rather than stick to the conventional approach if having simple, angular metal structures, Sauder instead uses wood and ornaments their products with attractive paint finishes, trims, and more. Their goal seems to be to make products that will blend perfectly in a home office setting to the point where many people wouldn’t even recognize it as being a file cabinet! Asking prices tend to be in the low to mid-scale. 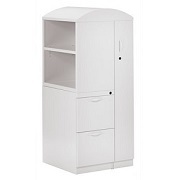 Space Solutions file cabinets are a very popular online purchase mostly due to their extremely low asking price. They come out and state that their products aren’t designed to be the toughest or longest-lasting on the market. Rather, they take pride in their very competitive cost and their ergonomic design that maximizes storage volume while minimizing how much space it takes up. They stick to a pretty typical design approach but do have a few different color choices. Storex is one of the few brands that make most of their file cabinets out of plastic rather than metal or wood. As you might expect, this significantly drives down the cost but also impacts performance. They do offer a few different color combos but most of their file cabinets are based on the same one or two-drawer design. Studio Designs does a lot more than just file cabinets but they do have a popular model that we felt it was worth checking out. 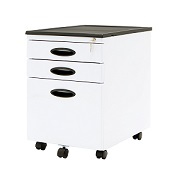 Their 3-drawer unit comes in multiple colors and is a combination of metal and plastic components. It is quite lightweight and is able to come in at a very attractive price. However, due to its relatively small size, it is mostly targeted towards small home offices. Tennsco takes a very different approach than most of the brands we have reviewed so far. Rather than having a lot of options for small offices or home offices, Tennsco instead focuses on file cabinets for commercial or major business settings. Operations such as doctors’ offices, architecture firms, or law firms will be their main target. This is because their cabinets are all very large and contain many individual drawers (with some examples having more than 25!). They are also designed with quality in mind but this does mean that they end up being quite expensive. 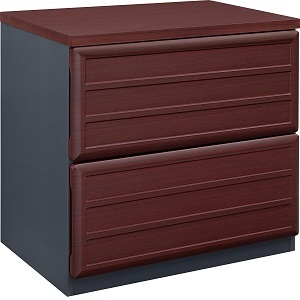 Z-Line Designs specializes in more traditional styles of file cabinets that closely resemble a nightstand or dresser you might find in a typical bedroom. Nearly all of their products are made of wood and they also tend to be a bit on the smaller side. While wood-based furniture is typically much more expensive than its plastic and metal cousins, Z-Line Designs is able to deliver on a competitive price point thanks to taking some manufacturing shortcuts as well as requiring a bit of assembly. 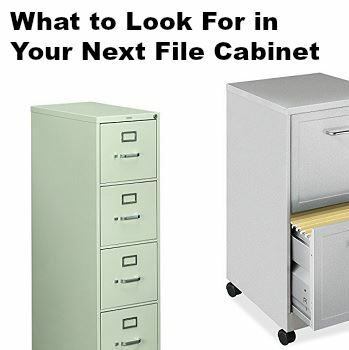 Before you go about purchasing your next file cabinet, you need to figure out what sort of needs and wants you really have. 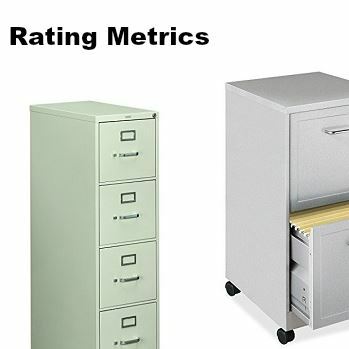 To assist with this, we have created rating metrics that we have determined are common areas of interest in file cabinets. When you purchase a file cabinet, you expect it to last. Depending on what size and brand you go with, investing in a set of file cabinets can be a significant expense and one that you and/or your company wants to try to minimize! The best way to sort this out (outside of costs) if finding a product that is designed to last for a long time. This boils down to build quality. 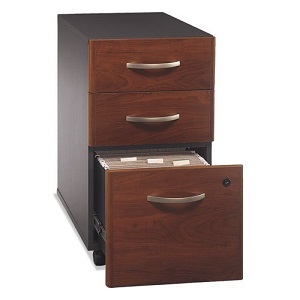 We look for file cabinets that are made of premium materials such as stainless steel and high-quality wood. In addition, having thicker panels, as well as reinforcements, play a huge role in maximizing the expected life of a file cabinet. Finally, having premium hardware (bolts, hinges, bearings, etc.) are equally vital as these typically govern the moving parts of the file cabinet. Also important to consider is what type of environment the file cabinet will be in. Those putting it in a small home office will have entirely different needs than a file cabinet going in a busy, high-traffic commercial setting. Once you get a good grasp of what type of load your cabinets will get, it will help you know what level of a cabinet to look for. Ease of Use refers to how “easy” the file cabinet is to own. This can span initial assembly, transportation, actively using it, maintenance, etc. You don’t want a file cabinet that is difficult to operate (heavy doors, hinges that don’t slide easily, difficult to move, etc.). Obviously, some factors go against others and are unavoidable. For instance, if you want a durable file cabinet that also has a ton of storage space, it is probably going to be large/heavy and difficult to move. Conversely, if you need something small and light for a home office it will likely be limited on storage space. We understand these ingrained limitations and take them into consideration when ranking a particular product. Styling refers to how visually attractive the file cabinet is. Obviously, this metric is subjective. Furthermore, certain styles and colors might not be appropriate in certain office settings. Since there are a wide variety of personal desires when it comes to looks, we give extra points for brands that solve this dilemma but simply offering a nice range of multiple styles and colors. This makes it much more likely that they will have a particular aesthetic the meets your needs. Cost is almost always an important consideration, no matter what type of product you are looking at. Like many things, asking prices can range immensely on file cabinets. On the lower end, you can find examples for fewer than 100 dollars. And on the higher end, they can easily reach into the multiple thousands of dollars. We don’t simply give a better rating because a particular product is cheaper. Rather, we compare it to products over similar asking price to determine what are good and bad buys at a certain price point. This rating combines all of the above metrics into an overall rating that will give you, the reader, a nice generalized idea of how “good” or “bad” a particular file cabinet is. As a rough generalization, we state that anything that scores a 3.5 or above is a decent buy. Items that score 4 or above are good buys. Items that score 4.5 or 5 are great and excellent buys and tend to be our top choices. That being said, just because a particular product scores below a 3.5 doesn’t mean that it might not be the right choice for YOU. Similarly, an item that scores a 4.5 or 5 might also end up being a poor choice for you (however it is much less likely!). That is why it is important to come up with a list of personal wants and needs to help you make the best decision for YOU. Read our “What to Look for in your Next File Cabinet” topic at the bottom of this review to help with that. These are our full reviews for each file cabinet we have reviewed. We break down how well they score in each of the metrics we discussed above. We don’t have much experience with 5COU’s build quality before this so we have to go off of a bit of anecdotal evidence. The products they offer seem to be made of quality materials and construction and should last for quite a while. They don’t skimp on material and the hardware seems to be made of high-quality metals. This does result in rather large and heavy products, however. The wood examples also have some construction shortcuts but this is the norm for most wooden file cabinets and also is there to cut down on weight some. 5COU’s file cabinets are very simple and straightforward in design. Thanks to the high-quality components, they seem to slide open and close without issue. Most of these products seem targeted for larger-scale professional and business settings so you will find that most have the ability to be locked and are also quite deep so as to be able to hold a lot of documents. As mentioned above, they are very heavy so transporting them and setting them up may be a challenge for one person or someone without a proper dolly. Since there are so many different colors and materials to choose from, just about everybody should find a product that meets their needs. If we had to be picky, we would say that they don’t have a lot of examples that really “stick out” in terms of styling. Most are very simple and straightforward. Also, while they do have some traditional wood pieces, these examples are the minority and someone dead-set on a wood file cabinet may want to shop a few other brands to get a larger selection. 5COU file cabinets range quite a bit in price but seem to hover around the middle to premium price range for a given size. These units are large and made of nice materials so having a higher asking price is more easily digested but, at the same time, it might push it out of some people’s budget. 5COU file cabinets really impressed us with the massive selection. Their choices in sizes, shapes, materials, and colors are one of the largest we have come across. The construction and craftsmanship also seem to be up to par. That being said, we don’t have a lot of experience with this brand and would like to see more proven field results to offer up a strong recommendation. They are also pretty expensive. Build quality of Alera file cabinets is overall quite good. Most of their products come with reinforced double-wall drawer fronts which do a good job of handling typical wear and tear. The side and back walls can bit a bit thinner (often only being a single layer of material) but should hold up just fine outside of something heavy running into them. The paint can also chip off some over time but that is the norm for most file cabinets. The hardware used is of good construction and a nice balance between quality and price. We really like how easy it is to open and close the drawers. This is thanks to the telescoping ball bearing slide suspension that exists on most of their cabinets. Also, even the largest sizes are relatively lightweight and much easier to move around than some of the competition. There are also side to side hang rails which allow for some adjustability in storage (depending on what size and shape of documents you are trying to store). We are a bit underwhelmed with most of the styling on these units. There isn’t much in terms of aesthetics and it seems that Alera is focusing on a professional environment where looks play little, if any, role. That being said, there are plenty of color choices to pick from but most tend to migrate towards “safer” and more subdued color tones. For the quality and functionality you get here, the asking price is very competitive. As expected, the final price is heavily dictated but what size unit you get. But for a given size, you will find that Alera is able to be competitive with most other products on the market with equivalent quality. 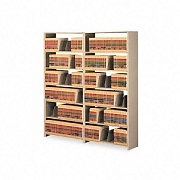 Alera file cabinets are a very popular choice online and for good reason. Their products have a nice range of sizes and shapes to choose from and seem to be focused for those looking for a simple and effective storage option for a business or professional setting. The material used is thick where it counts and still able to keep the weight down for the most part. Also, we are happy that the asking price is also kept at a competitive range. You should definitely consider looking at Alera for your next file cabinet purchase. In order to achieve the price point that Altra Furniture does, it has to make some sacrifices. One of these areas is in the build quality department. The material here can be quite thin and flimsy. Where thick double-layered steel may be used by other brands, Altra will stick to thin metal that is much weaker. Where other companies will use thick and heavy premium wood, Altra will use thin particle board. The results are products that will not be able to handle the typical wear and tear present in high-traffic business settings. But for a home setting? They may perform just fine. There are also some notable fitment issues. Sometimes doors and drawers will be a little off-center which not only looks bad but also affects how easy they are to slide open and close. The main positive here is that these units are extremely light. This is thanks to typically being on the smaller side and also being made of much thinner and lightweight material. However, this does come with some major cons. The drawer sliding ability definitely suffers. Lower-quality sliders and bearing that is oftentimes off-center means that drawers can be very stubborn to open and close. In addition, there have been quite a few complaints about Altra file cabinets being TOO small to the point where it is difficult to reach to the back of a drawer. It is important to really consider what your desired applications are to see if these are dealbreakers. Altra really stands out in their aesthetically-pleasing designs. There are some great-looking products that span from typical metal finishes to wood finishes and also some more modern styles that include multiple colors and embossed drawers. Many of these products would blend right in at your home and may actually be one of the centerpieces of a stylish office space. However, when you get closer to them some of the quality issues may stand out. Off-center doors and cracked/chipped paint could be a major turn-off and has been seen on many of their products, sometimes out of the box. Altra Furniture file cabinets are among some of the most affordable in the industry and this plays a big part in why they are so popular. Simply put, some people just can’t afford to spend hundreds and hundreds of dollars on a file cabinet and Altra has products perfect for them. As seen above, however, this does come with some major sacrifices. Altra file cabinets have some major selling points as well as some glaring issues. The asking prices are very competitive on them and we love the stylish aesthetics that many of their products possess. They are also very simple and lightweight to handle which makes them great for a residential or home setting. However, the build quality and materials used take a major blow and this also expands to the ease of use and can even affect the appearance of these models up close. For those on a shoestring office budget you may have to overlook all of that but for anybody willing to spend a bit more you can get much higher-quality products. Most of Bush Furniture’s cabinets are made of wood and takes a mid-level approach on quality. While you won’t see the extremely thick and durable wood and metal components that exist in the more expensive brands, what you get here is for the most part acceptable. And on the opposite end of the spectrum, you don’t have to deal with the flimsy cardboard and particle board that some of the ultra-budget brands resort to. There can be some minor fitment issues that may make initial installation and operation a bit more of a hassle but we have seen that these are, for the most part, few and far between. Also, the hardware used is serviceable but by no means industry-leading. This is a commonplace that we see companies skimp on some to drive down the price so we aren’t really surprised. Finally, Bush Furniture file cabinets come with a 1-year warranty which is a nice touch. 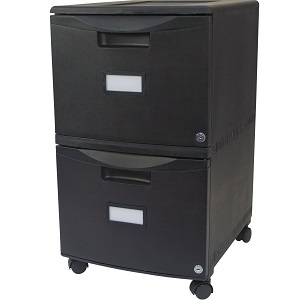 Seeing how most of Bush Furniture’s file cabinets seemed to be targeting residential or small office settings, it is important to make a product that is easy for anybody to use. The cabinets and drawers are able to be strong without becoming super bulky and even the largest sizes available or a lot smaller than many of the commercial designs which make them much easier to move and handle. The ease of opening and closing the drawers is really dependent on how good the fitting is. For the most part, the slides are properly aligned so that they can easily be opened and closed. Some people have also complained about the back of drawers being difficult to reach but we haven’t had any trouble with it. One of the biggest selling points with Bush file cabinets is in their styling. They are very attractive pieces that look nice in an office setting. We like have many different color choice and design options there are. For those after traditional plain and metal products, you may be a bit underwhelmed with the selection but there are plenty of other brands that offer just that. In particular, we really enjoy the multi-color cabinets that have a different top-shelf color than the drawers. For the combination of looks, performance, and durability, the asking prices here are quite fair. Compared to the rest of the industry, we have found that most of Bush Furniture’s file cabinets hang in the budget to mid-price tier. This helps for them to be obtainable from everyone from those on a tight budget to those with a bigger spending range. For anybody who is after the very best and toughest and will pay anything for it, you may want to look elsewhere, however. We really like the approach Bush Furniture took with this lineup of cabinets. From the styling to the quality to the price, they have found a formula that really hits home with us and their many customers. Yes, there are tougher and higher quality products out there but you will pay a lot more for them and also be limited in the styling designs. For everyone else, you will likely find something that meets your needs. For the asking price, the build quality of CommClad file cabinets is excellent. The materials used are plenty thick and the metal doesn’t feel weak or flimsy. Also, the hardware is made of high-grade metal and you don’t have to worry about it breaking or failing prematurely. Since these products are intended for busy business settings, having tough components is essential and CommClad meets our expectations in that regard. The only minor complaint we have is that sometimes the paint job can be a bit hit or miss. But seeing how these cabinets aren’t being submitted for a beauty contest or anything, that isn’t a huge deal. Being made of thick quality materials, these can be a bit on the heavy side and large side. However, once it is properly set, this is not a big deal. The drawers are large and deep which gives you plenty of storage space and they are designed to be able to handle a vast array of paper sizes. Equally important is the ability to reach all of those things. The doors are nice and large so you don’t have to strain with your arms to access the content you need. The sliders and moving components are installed properly and we haven’t had any issue with having to struggle to get a door to properly open and close because of misalignment. CommClad file cabinets are very Spartan in appearance and don’t have much in the way of aesthetic features. Nearly every example is nothing more than a metal cube with sharp edges and simple handles. There are a few different color options but most are rather muted and “office-safe” as we like to call it. Also, the paint issue mentioned above might also take them down on the attraction scale. But for those after a simple and effective file cabinet for an office, these really aren’t major issues. For the level of quality and ease of use you get, the asking price for these is excellent. CommClad has managed to price these units at a level that rivals many other low-cost brands but blows most out of the water in terms of quality. However, they partially accomplish this by not making “pretty” designs so for those after something for a stylish room in your home, you may have to end up paying a bit extra from another brand to find something. Hirsch Industries (AKA CommClad) brings to the table a nice selection of office-oriented file cabinets. Their products, while a bit plain and dull looking, have excellent craftsmanship and material usage. They also perform very well and we have no gripes with the operation or maintenance of them. And all of this comes at a very attractive price point that most people will be able to afford. These are a great buy in our book and a brand you should heavily consider checking out. There can be a bit of variance on build quality depending on which particular model you go with. Some of Devaise’s top models have reported excellent build quality with few complaints while some of their less popular units are riddled with more issues (this may explain why the more popular cabinets ARE more popular!). However, in summary, you can expect pretty good build quality for the asking price. Most of Devaise file cabinets aren’t really designed for high-traffic settings typical in commercial businesses and are much more at home in residential settings. Typically, residential settings will not have nearly as strenuous of a load and these cabinets are more than capable of handling those. The materials used are relatively thick where it counts but some of the back panels can be a bit on the flimsy side (likely to save cost and weight). 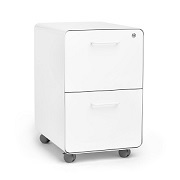 One aspect that we really like about many of Devaise file cabinets is their wheeled feature. Having wheels makes it much easier to move around on hard surfaces and quite frankly we are surprised more other brands don’t utilize these. Considering that many of these products are also on the lighter side means that they are extremely mobile. That being said, there have been some issues with the drawers being a bit too small. This not only may require you to orient your stored items differently than you would like in order for them to fit but it also makes reaching for the back of the drawer a bit more challenging. The styling aspects here are quite nice. You get a nice variety of styles, ranging from simple muted metal colors to multi-color wood examples. Quite a few of these file cabinets will fit right in your home without being an eyesore. In fact, many people actually plan the rest of their office around some of these attractive file cabinets! The asking prices here are very competitive and are firmly into the budget tier of file cabinets. Yes, the units are quite a bit smaller and not quite as “tough” as many of the more expensive models out there but for someone simply wanting a small cabinet for their home office, these will work perfectly fine. Devaise file cabinets bring to the table a lovely array of smaller, residential-inspired examples. The asking prices here are very competitive and, despite that, this brand is able to have acceptable quality and great mobility thanks to lightweight construction and plenty of wheeled options. We also like the styling on many of these products. Those after stronger and larger file cabinets for industrial applications won’t have much here to get excited about, however. Out of all of the file cabinets that we have reviewed, you will be hard-pressed to find another brand that is as tough as Fireking. All of their file cabinets come in extremely thick rust-proof steel that is also insulated to help protect the important inside documents from fire, water, and more. Specifically, you can expect a UL 1-Hour Class 350 fire rating, a 30 foot UL impact rating, 30-minute electronic media protection, and ETL water resistance. All Fireking file cabinets are made in the USA and come with a lifetime limited warranty and free fire replacement, both of which are things you will rarely see in other brands. As you might expect, these units are extremely heavy and quite bulky considering their storage size. This is simply the price you pay for a cabinet that can handle what these can handle. Moving them can be a bit laborious and you may need some extra space to account for how large they can be. The drawers, while quite heavy, are still relatively easy to maneuver and there is plenty of room inside for all of your items as well as easy access to retrieve them. Everything is also scratch-resistant so you don’t have to worry about that. These are rather plain and mundane cabinets. They come in a handful of colors but all of the color options are very “safe” and are a one-color finish. The handles are also very average which perfectly matches the sharp corners with no major aesthetic features that jump out at you. We assume that keeping things simple in the design department was a requirement for Fireking to achieve the level of toughness and quality that they do. Or perhaps they just assumed that people they are targeting aren’t really concerned about looks. Either way, if you are wanting an attractive and sleek file cabinet to stick in your bedroom or home office then these probably aren’t for you. There really is no way around it: Fireking file cabinets are extremely expensive. The combination of high-quality materials, careful craftsmanship, and an amazing warranty equal a lineup of products that will be at the top of many people’s budgets. But for those with extremely sensitive and important documents that absolutely must be kept safe, these file cabinets are among the best there is and are more than worth the high asking price. Fireking has a very impressive lineup of extremely tough and durable file cabinets that can handle literally anything you can throw at them. Their construction and material selection is top-notch and we live that Fireking stands behind their products with a lifetime limited warranty. However, the styling is very mundane, they are extremely bulky, and the asking prices are super high. Whether or not a Fireking file cabinet comes into consideration for you will really depend on your individual needs and the importance of the documents you are wanting to keep secure. The materials used here actually aren’t that bad. The metal, while a bit thin, does an acceptable job of supporting itself as well as documents inside. The hardware is a bit cheap but does the job and should only have issues in very busy settings where you are constantly opening and closing the unit. There are some notable issues, however. First, the wheels typically don’t come attached and there is little instruction on how to use them. There have been some complaints of people not receiving all of their hardware to properly install the wheels, resulting in a cabinet that isn’t fully functional. Also, most of Giantex’s cabinets don’t come with file racks so that is another thing to consider. Being a small and rather thin cabinet, these examples are quite portable and can easily be moved by one person. The drawer space, however, can be a bit lacking and you may have to convolute your larger items to properly fit inside. In addition, as mentioned above, you may have to source out some of the components such as a file rack. But for the asking price, we can’t be too picky. 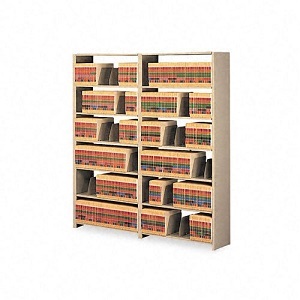 There is a rather simple yet unique style with many of Giantex’s file cabinets. Many come in sleek black or white finishes with groove access handles and indented notches. This is a very progressive and modern look and appears quite striking in the right environment. Many people will likely not even realize that these are file cabinets! However, for someone after a simple and “normal” style, you may be a bit turned off here. 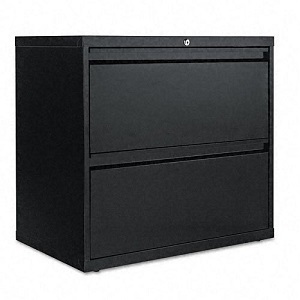 The cost of a Giantex file cabinet is very reasonable and among the more affordable options out there. This isn’t a surprise as they tend to be on the smaller side but even compared to similarly-sized products from other brands, Giantex’s asking price tends to lead the way more often than not. There are some minor issues with craftsmanship and the occasional missing component but that is to be expected in this price range. Giantex file cabinets bring to the discussion some small, sleek, and modern examples that are at a very nice price point. The material and build quality are acceptable although some people may need something with more storage space and that more resembles a “traditional” file cabinet. This can be added to your shortlist if you are after something simple and low-cost for your home but for anything grander we recommend going with another brand that offers larger and more capable units. Great Openings deals in premium materials, with steel probably being their top choice. They also do a lot of custom work which shows that they have a good handle on the steps in the construction process and that they don’t import or rely on others for the products they sell. Their units are made in the USA and are protected by a lifetime limited warranty, which we love to see. Upon closer inspection, the walls of their drawers are very thick and the hardware used is top tier. We really can’t find any shortcuts that they took in the construction process. The unique thing about Great Opening’s approach is that they seem to build units that are strong enough for commercial and industrial applications but style them and target them towards residential settings. Since a home office typically doesn’t experience near the load of a busy business setting, you can rest assured knowing that these products will last for a long period of time. We really like the fluid motion of the shelves and drawers and how easily they open and close. This really boils down to good fitment and assembly steps but it directly translates to a very enjoyable user experience. The drawers are plenty large and designed to handle various shapes and sizes of documents. Really our only complaint is that they can be quite heavy but that is typically how things go when dealing with premium-level file cabinets. Great Openings file cabinets come in a lovely array of shapes, sizes, and color schemes. 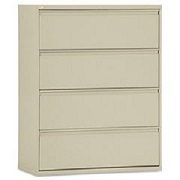 In fact, many of their products barely resemble file cabinets and could be mistaken for a dresser or nightstand! We really like this design approach as it allows these products to fit much more comfortably in a home setting. In addition, since this company can do custom work and manipulate their products into all sorts of color schemes, no matter what you are after, they likely can work with you. And for those after a more traditional look, there are choices for you as well. These products are very pricey. This is attributed to being made of premium materials, being made in the USA and not imported, and have some really unique aesthetics that make them stand out from a lot of their competition. We also feel that Great Openings hits a bit of a niche market here. There aren’t just a ton of higher-end residential style file cabinets out there. So for those with deep pockets and wanting something that looks as nice as it performs then this product lineup might be right down your alley. We really don’t have any complaints about Great Openings file cabinets outside of their high asking price and somewhat limited availability online. And considering what all you get, the asking price is still more than justifiable for us. You will enjoy an exceptionally well-made product that is plenty spacious yet simple to use. It also comes in some lovely designs that we have not seen in many other places. For those wanting to bump their home office up a notch, definitely check this brand out. We have mixed feelings about the build quality of HON file cabinets. The steel that is used is of acceptable quality and the wood follows a similar approach. We found that the material is adequately thick and should hold up to most typical wear and tear. We did notice that some of the back panels are a bit too thin, however, and are more prone to being dented or scratched. There are also some minor issues with alignment where doors don’t always sit perfectly flush with their sliders, resulting in a bit of resistance in opening and closing. Now don’t get this confused with the sliders they use: they are great and super smooth thanks to their ball-bearings. If they could ensure that the fitment issues were taking care of before leaving the manufacturing facility it would help immensely. 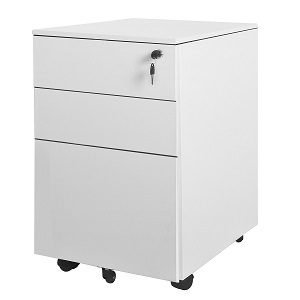 The drawers are light enough to be easy to open and close and the size and weight of HON file cabinets is middle of the road. We are happy to report that the dimensions of each drawer are large enough to fit documents either vertically or horizontally which is always a nice touch. The major concern lies with fitment issues with the doors. If you happen to get an example that has proper alignment then these are some of the easiest file cabinets to use in the industry. If you are one of the unlucky few who get a product that isn’t properly aligned then you will have to deal with fighting the drawers due to increased drag resistance. Taking a hybrid approach where you can use these file cabinets both in home offices as well as in established businesses, HON designed them as such. You will see some slight variances in styling and color options and there are also some different types of handles and materials to choose from. But you won’t find some of the super progressive designs that make you second guess if a product is actually even a file cabinet. This “safe” design approach should hit home with a lot of people. As you might expect from reading the rest of this review, HON’s asking prices are around mid-tier. Given the build quality and styling, this price is reasonable. There are higher-performing and tougher products on the market but they are more expensive. Conversely, for those on a tight budget, there are much cheaper examples to be had but they may sacrifice additional build quality and aesthetics. HON file cabinets are an acceptable product choice for those people wanting a mid-tier level product that stands out in some areas but still sticks to many conventional design ideals as well. Performance and usability are good with the exception of some examples that have some fitment issues. We would recommend trying this brand out with the caveat that you save your receipt in the case that you get one that has fitment issues so that you can easily replace it. First off, when looking at file cabinets at this price point, it is important to go in understanding that not everything is going to be perfect. The key is to offer high enough quality to make people happy while still making sacrifices where possible to drive the price down. Overall, the quality here is acceptable. The components are made of true metal and/or wood and, while sometimes thin, should hold up to typical wear and tear. These cabinets are a bit on the light side and sometimes aren’t perfectly balanced so you may experience some slight wobbling when they are empty. However, as you begin to fill them up with items, they should become much more stable. The components such as the handles and sometimes even the sliding assemblies may require some minor assembly and every once in a while we ran into complaints that the supplied hardware as a bit “off”. You may have to use a bit of ingenuity to get everything together with a hitch. Finally, the metal is somewhat prone to dents and scratches. While this doesn’t affect the functionality, it can hurt the aesthetics some. These are very lightweight and relatively sleek cabinets so transportation and set up should be a breeze. However, there are some minor issues worth noting. First, the design of the sliders results in the drawers not being able to fully extend out. You will find that around 5” of drawer length is tucked inside the body of the cabinet. This makes reaching objects in the back more challenging as you will have to reach up and inside to get to them. Also, the lock can be a bit stubborn and not always properly engage. Depending on which model you go with, there may also be a bit of initial setup ranging from installing the wheels and handles all the way to full installation including inserting the sliders and drawers. Lorell file cabinets really shine in the styling department. There is an enormous range of color and style options to choose from. No matter if you want a traditional steel off-white file cabinet with uniform handles, a more progressive metal cabinet with extruded handles, or even wood cabinets that can fit well in a residential or casual setting, Lorell has a product that can meet your needs. From far away, nearly every model looks very nice. If you get up close and personal you may see some of the “budget” stick out, particularly if the unit has some minor dents or scratches (which they are prone to getting). We are really impressed with the competitive asking prices that Lorell brings to the table. While they do offer some higher-end units, even these are very reasonably priced. But their bread and butter appear to be lower-cost examples that can fit in just about everybody’s budget. And while we have noted some potential quality issues above, they still, for the most part, do a good job making a product that still performs well. Lorell is one of the larger suppliers of file cabinets online and that is for good reason. Their huge lineup really hits just about every target demographic outside of those looking for the absolute pinnacle in durability and security. They strive to offer products that do the task they are intended to do while being very affordable and this formula is obviously working for them. While there are some usability issues present in some of their models, the great asking price and nice looks make up for it. The build quality of Mayline file cabinets is superb. High-quality metal and wood are used and they are designed to be very sturdy and strong. Since the priority is in professional settings, it is important to make products that can handle higher loads of use than a typical home office. Mayline is up for the challenge thanks to their thick panels and reinforcement as necessary. For the products with moving and sliding drawers, the sliding mechanisms are also of high quality and can handle the added weight of stored files with no problems. And many of their products are backed by a limited lifetime warranty which further represents the level of quality you get to enjoy. Initial setup of these products can be a bit burdensome. Many of them are extremely large and heavy and may require a small team of people to set up. This is particularly true if you are doing a larger custom setup with many cabinets in rows. You may decide it is simply easier to hire professionals. However, once set up, you will enjoy a streamlined and easy user experience. Mayline has spent a lot of effort designing their cabinets to be optimized for their target environment. 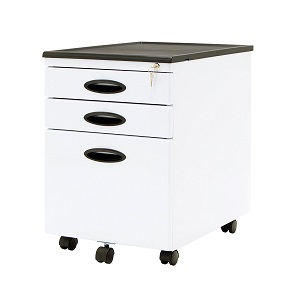 For instance, if you are a doctor and looking for cabinets that are designed to store medical files, you will find that a Mayline medical file cabinet will be much easier for you to use compared to a generic cabinet. Conversely, if you buy one of their cabinets designed for something else and plan to use it as a standard file source then you may find that the drawer sizes and shapes are a bit off. We absolutely love the styling of Mayline cabinets. There are plenty of more progressive and modern looks as well as traditional styles for those who want to keep things simple. The wood finishes are lovely and you can really tell the difference between these and a budget wood file cabinet. Where Mayline really shines is when you get up close and personal. The moving parts, small components, and other areas that you only see when nearby give off a much higher-quality feel than a lot of their competition. According to their website, they also appear to have some customization options which is always a great touch. For the great craftsmanship and looks you get with a Mayline product, you will have to pay a rather high price tag for it. The combination of specialized design, high-quality components, and careful construction add up and many people will find that these products are outside of their budget. As we mentioned above, those after a simple file cabinet for their home office may want to look elsewhere. But for those with a professional or industrial need and have a much bigger budget, Mayline will be at the top of your list. We love having a variety of cabinet choices to meet every need and Mayline fills a big void that most other brands don’t dare to test. They offer durable, stylish, and optimized file cabinets to meet the specific needs of their clients. The build quality and adequately designed functions are certainly there. But they are very expensive and will likely be more than many people want to spend on a simple file cabinet for their home. But for a business? Absolutely check them out. The build quality isn’t bad here but it is about what you should expect for such an affordable product. You won’t find extremely thick reinforced steel barriers on this unit. Instead, you will have somewhat light and thin metal. That being said, it will still perform fine in most home applications. The sliding mechanisms aren’t buttery smooth but are acceptable in most cases. The casters, while made of cheap plastic, do the job and add a nice rolling element to the equation. The lock is also a simple metal latching mechanism but will work fine in most cases. You may see some slight bending or denting of the metal shelving which could make things not perfectly flush but it doesn’t seem to affect functionality. 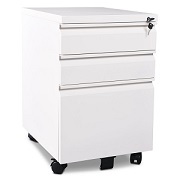 Merax file cabinets are very easy to use and are quite mobile thanks to the combination of being lightweight and also having a rolling element. There will typically be “small” and “large” drawers which allow you to store a variety of items but if you having a lot of larger documents (such as things printed on 11”x17” paper, thick folders, etc.) you may be wishing that you had a bit more storage space. The drawers do an acceptable job of extending out and giving you access to most of the inside area. All in all, these are very simple and effective to use. You have a few different color options here (mostly centered around white and black) but beyond that, there isn’t just a ton of aesthetic differences. Nearly all of Merax’s products don’t have conventional handles and rather have grooves that you can grip and use as a handle. Some people prefer this design while others like handles that you have to mechanically slide to open and close a drawer. Also, if you are after a wooden cabinet then you will be out of luck because, as far as we can tell, Merax deals exclusively in smooth metal file cabinets. We are really enjoying the great prices that Merax has for their cabinets. These are among some of the most affordable units you will find. This isn’t really a huge surprise as they are all on the smaller side and are made of somewhat low-cost metal components. But the performance and reliability and more than acceptable so we are happy with the price point that they chose. Merax has a somewhat polarized product selection but they have proven that it is a popular selection due to their nice online sales. They focus mostly on simple, low-price, and small file cabinets that really are best used in small home office settings rather than large businesses or corporations. If you are on a tight office budget and just want something small and simple then you should check our Merax. For everyone else, you will probably have to shop elsewhere. So in terms of construction, Office Dimensions uses drawer walls that are about as thick as many other brands. Their attachment points are also suitable. Components such as the ball bearings for their drawers, the handles, etc. are also of high enough quality to pass our requirements. The issue is in the packaging. There are tons of complaints about these units arriving with huge dents or scratches on them. This partially has to do with the thin metal that is used not being able to handle transportation but it also has a lot to do with poor packaging. The dents can be so bad that they can even affect the functionality of the unit, causing drawers to not properly open and close. This is a major concern that the company really needs to address and figure out a solution to. From a size and weight standpoint, Office Dimensions file cabinets are really not that heavy and are easy to move to where you need them to go. Also, the drawers are nice and smooth thanks to precision bearings. The problem (which we already addressed above) is that there can be a lot of damage to the product when it arrives and this can directly contribute to the file cabinet not properly working. You may find yourself constantly battling the drawers to try to get them properly aligned. In addition, the handles can also become somewhat loose and may wiggle when grabbed on to. However, they are of proper size and depth to store plenty of documents of that size. Styling is, for the most part, very conservative. It is obvious that this company wanted to focus mostly on professional settings where having an elaborate and “pretty” file cabinets may be unnecessary or even frowned upon. There are a few exceptions to this rule but they are few and far between. Also, the unsightly dents and scratches that are very common on these may make them appear to be of low-quality. This isn’t a huge deal if these are going to be tucked away in a storage closet somewhere but in high-visibility areas, it could be a big turnoff. Asking prices for these are about middle of the road. If you happen to get a unit in that is not damaged and works properly we feel that these prices are justifiable. The problem is that simply too often you receive a product with dents in it at which point we don’t see a good bargain here. Office Dimensions file cabinets focus mostly on office settings (as the name might suggest) and bring to the table a selection of proven and popular cabinet sizes and configurations. The materials and components used are nice enough but the problem is the very common damage that occurs during shipment. This can not only make the final product appear unsightly but can even affect the functionality of it. If you can find these in a store so that you can inspect them they aren’t terrible but we feel it is too much of a gamble ordering them online. It appears that Office Realm imports a lot of their products which means you will likely be purchasing a product that was produced by a totally different company (some of which we have reviewed on here!). However, they seem to have sourced out proper suppliers and most of their products are of acceptable quality. In terms of build quality, their drawers are relatively thick and typically made of a mid-grade metal. The hinges, sliders, handles, etc. and also typically metal and seem to hold up to standard wear and tear that you would experience in office settings. Some of the backs of their cabinets are a bit thinner but this is also quite normal and we have seen many other companies follow this approach. We like how Office Realm has seemed to focus mostly on products with nice, large drawers with plenty of storage space. This makes finding room for various sized documents and folders much easier and you shouldn’t have too much of an issue fitting everything that you need. They can be a bit large and bulky but this is fine with us as heavy = stable. A lot of their file cabinets are in the more “modern” design in which they don’t have actual handles. This is a good thing from a usability standpoint as fewer handles mean fewer things that can go wrong. However, for those that want a bit more security in opening a drawer, you may be turned off by this. A nice selection of styles and colors awaits you. While most tend to lean a bit more to the progressive side of things by not including conventional handles and being sleeker in design, they are still conservative enough to fit right at home in a professional setting. The metal that is used is mostly brushed or only slightly glossy which we prefer for offices. Large drawers are the norm here so if you prefer petite drawers to match other furniture then you may be disappointed. The asking prices on most of Office Realm’s file cabinets tend towards the higher end of the spectrum. While the quality is fine and they do look quite nice, this high asking price may simply be out of reach for many. We also noticed that you can purchase the particular brands from other sources (such as direct) and it ends up being much cheaper. Office Realm has a large selection of office supplies and their file cabinets find a nice middle ground between being stylish while also presentable in a business setting. Despite being imported, construction and fitment are very good and should last for a long time. But it does come with a lofty price tag in most cases so plan to open your wallet a bit wider if you want to enjoy one of these products. If you do have your heart set on a particular brand that they sell, you may be able to find it cheaper buying directly from the manufacturer. Don’t let the small and quaint size of Poppin file cabinets fool you: they are actually extremely well built and designed to last through many years of usage. The steel used is quite thick and well made with no real weak points to be seen. The fitment of the drawers is also quite nice and we saw no issues with gaps or interference that can make it difficult to operate the file cabinet. There are also no mechanical handles which mean one less area for something to go wrong. 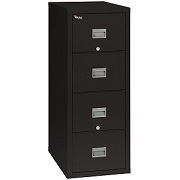 Overall, these are some of the most reliable file cabinets we have come across. These products are quite small so mobility is very simple. And when you consider that many of the units even include wheels, you are left with a cabinet that is a breeze to move from one place to another, particularly if you have hard floors. As we alluded to above, the fitment of the drawers is very accurate and that, coupled with the smooth sliding mechanisms, makes it very easy for anybody to open and close a drawer without strain. The one issue you may have is finding enough room for all of your documents. Every single Poppin file cabinet we have experienced has been the same 3-door setup with the bottom drawer being the only “large” on. So if you have a lot of folders or large documents you may struggle to get them all stored in a single cabinet. These are very sleek in appearance and look great in a modern home office setting. 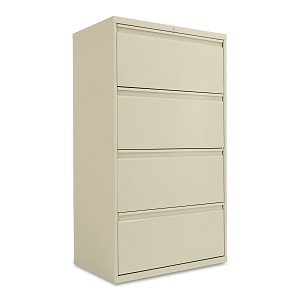 Probably the first visual aspect you will immediately notice about Poppin file cabinets compared to other brands is that the corners are curved instead of pointed. Frankly, we wonder why so few other brands have tried this approach as we really like how it makes the overall unit come together. Another very unique twist is the available color choices. While most traditional file cabinets come in somewhat muted colors and perhaps some browns and blacks, Poppins offers up some much more vivid colors such as orange and lime green. This may look a bit cheesy in a professional office setting but it is a great way to liven up a home office. Now for the bad part: for the size of storage space you get with a Poppin file cabinet, they are quite expensive. For their asking price, you will be able to find other much larger cabinets with significantly more storage space. However, what these do have going for them is their great build quality and a look that you won’t find with any other brand. We really like the refreshing approach that Poppin takes with their filing cabinets. Instead of large, bulky, and boring products, they have offered us small and sleek examples that look and perform great. The major limitations will be in the storage size and the relatively high asking price but if you are interested in getting an office product that will liven up the room and you don’t have a ton of files that need to be stored, then consider checking them out. For the asking price, we are pretty disappointed with the quality of Sandusky file cabinets. The metal walls are rather thin and it is very common for drawers to not be properly aligned. An even bigger issue is the packaging. It is extremely common to receive one of these products only to find out that it has multiple dents. And sometimes these dents are so bad that they can actually affect the operation of the file cabinet. Furthermore, the hardware used is rather flimsy and can easily be broken or bent. All in all, there are some major quality control issues that Sandusky needs to sort out. Being rather large, these products have tons of storage space. The drawers are large and spacious and can easily handle all sorts of shape and size of documents. However, there have been many reported issues of the drawers not properly opening and closing and sometimes even becoming completely stuck due to alignment issues. This problem can become even more serious if you are one of the unlucky people who receive a damaged product. We must say that we really like the nice variety of color choices that Sandusky offers. While the design of their file cabinets is pretty standard, they are able to spruce things up a bit by offering nearly every color you can think of as options. They also have a nice variety of handle shapes and sizes, ranging from conventional square metal handles to no handles at all. They also have some really need hybrid file cabinets where there are exposed shelves above the drawers. Sandusky file cabinets are aligned in the mid to premium price tier. When you get into this price range, you can be pretty picky about the performance and quality of the products. Unfortunately, there are some major issues with quality that makes it hard to justify such a high asking price. Sandusky file cabinets really wowed us with their huge selection. No matter what size or drawer count you are looking for, they probably have something for you. The color selection is also immense. However, there are some serious problems with the build quality and it is very common to receive a damaged unit that is so bad that it may not even operate properly. And give the quite high asking price, we expect more from them. As we are sure many of you are aware, true wood furniture is very expensive. The fact that you don’t get immediate sticker shock when you see the asking prices of Sauder file cabinets should instantly tell you that some shortcuts were made. The wood they use is more of a pressed wood panels rather than true wood pieces. These panels aren’t quite as tough or sturdy as conventional wood so they are more prone to being dented, cracked, and damaged. That being said, the build quality is acceptable but by no means blew as away. You can expect a few years of proper operation considering typical wear and tear before cracking and warping may rear their ugly heads. The fact that pressed board is used here does have the benefit of making these products much lighter in weight. They will be easier to transport than traditional true wood furniture. However, as mentioned earlier, this makes them more prone to cracking and warping which can affect how smoothly the drawers open and close. Also, the storage space is a bit lacking as more of the volume of the file cabinet is taken up by the wood panels when compared to a typical metal cabinet. You need to make sure that you don’t have a ton of paperwork that you want to file or else you may run into space issues. We absolutely love the aesthetics of Sauder file cabinets. They really do stick out from most of the competition and manage to give something as boring and cold as a file cabinet a warm and inviting feel. These units are great for a home office where you want to make all of the furniture work well together. Plus, there are enough variety and color choices to match just about any room. But if you are after a typical metal example you may be out of luck. The asking prices here are actually pretty competitive. 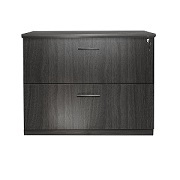 Many people will assume that Sauder file cabinets cost a lot more than they actually do. Despite using pressed panels, Sauder manages to do so without giving off a cheesy or “cheap” look. However, you will also deal with the negatives of a using a cheaper material in regards to performance and life expectancy. Sauder file cabinets bring a classy twist to what can oftentimes be a rather mundane product lineup. Their warm and attractive wood-based cabinets are optimized to fit right into a home environment. And the asking prices are very good considering how nice they look. However, you do have a few cons to this approach. The performance won’t be quite up to par when compared to true wood and you do have some spacing limitations. But for a smaller home office, they aren’t a bad choice. These are very low-cost file cabinets and this directly shows in their build quality. The metal used is very flimsy and is easy to dent or scratch. In fact, don’t be surprised if your product is delivered with some dents already in it. The fact that it is so easily dented also can wreak havoc on proper drawer spacing. You may find that the drawers don’t properly open and close due to interference from dents. Also, the internal components are low quality and can break prematurely as well. But again, this is what you should expect from such an economy-oriented product line. We will admit that, given how much volume Space Solutions file cabinets take up, there is a good amount of storage space. This is primarily due to this company fitting in as many drawers as possible. Several of their most popular products actually have a small third drawer on top. In many other competitors’ products, this third drawer would not be included. However, the drawers do not even get close to coming all the way out. This limits how much space you can easily access and you may find yourself having to uncomfortably reach up and inside the drawer to access items that are stored towards the back. Also, as mentioned above, any dents that exist may significantly affect how smoothly the drawers open and close. There aren’t a lot of aesthetic features present on Space Solutions file cabinets. They are more or less colored boxes with handles. Many other brands have utilized built-in handle grooves but we assume Space Solutions didn’t implement that because it would require thicker walls which would take away precious storage space. Really the only positive worth noting is that there are a few different color choices. The biggest selling point to this company’s file cabinets is their super aggressive asking price. You will be hard-pressed to find a more affordable file cabinet out there. For those on an absolute barebone office budget and are willing to sacrifice quality for cost savings, these will be the way to go. Just go in understanding the significant negatives. Space Solutions file cabinets hit a unique niche in that they focus on extremely low-cost, space-saving products that aren’t designed for very strenuous office work. The components and materials are constructed with cost savings in mind and you will have to deal with a cabinet that is easily dented and may not last nearly as long as you would have hoped. These may work for people on a shoestring office budget but for most people, they will be better off spending a bit more to get a much higher-quality product. The build quality with Storex file cabinets is very poor. The plastic is very thin and simply doesn’t hold weight like you would hope for it to. This becomes an even bigger problem as you start storing items inside. The weight of the items will literally cause the drawers to warp, making it very difficult to open and close them. Also, the plastic is very prone to being dented and cracked over time. Another major gripe is that there have been many reports of various components such as casters or wheels not coming in the packaging. This leaves you having to contact the manufacturer to try to get the spare parts you need. The one thing that Storex file cabinets have going for them is that they are extremely lightweight. While most other file cabinets require multiple people to strain in transporting them, these cabinets can easily be moved by one person. Beyond that, there isn’t a lot to get excited about. The drawers are rather small which makes accessing the back of them very difficult. Also, as mentioned above, the plastic used is easily bent and warped and can get to the point where you may have extreme difficulty opening and closing the drawers. There are a few different color choices but not much variety beyond that. All of these cabinets essentially look the same. We assume that there is only one type of mold that Storex uses on these. Also, the fact that they are made of plastic gives off a “cheap” vibe and most professional settings would probably opt for something that looks more presentable. The big positive is that Storex file cabinets are extremely affordable. 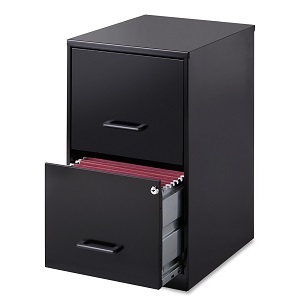 In fact, they are probably the cheapest option you have in regards to a file cabinet. However, they come with some huge sacrifices in build quality and usability as outlined above. We appreciate Storex trying to think outside of the box and make their products out of plastic rather than the conventional wood or metal that most other companies use. The result is an extremely affordable and mobile product that should fit everybody’s budget. The problem, however, is that going with plastic results in too big of an impact on the performance and toughness of the cabinet. Furthermore, you are also severely limited in storage space. There are much better choices out there even if they cost a bit more. While we tend to be leery of file cabinets that have plastic, Studio Designs file cabinets utilize metal where there will be significant loads and plastic elsewhere. This combination is able to keep most of the positive attributes of metal (tougher, stronger, more attractive, etc.) while also having some positives of plastic (more lightweight, more affordable, etc.). They are able to pull this off quite well as this product is quite tough and should last for multiple years of typical use. The components are also of acceptable quality and we haven’t heard any issues with them cracking or breaking prematurely. The metal/plastic combo really shines here. This file cabinet ends up being quite lightweight and, with the combination of its roller wheels, is super easy to move from one place to another. There is a big limit on storage space, however. And the top two drawers are very short and narrow which may make accessing items towards the back more difficult. The bottom drawer is much larger and can easily fit your typical folders and documents. The styling is simple but modern. We really like the progressive handles that Studio Designs installed and it really makes it stand out from much of its competition. There are a few different colors to choose from but it is by no means vast. Also, those after a traditional wood-styled file cabinet will be out of luck. 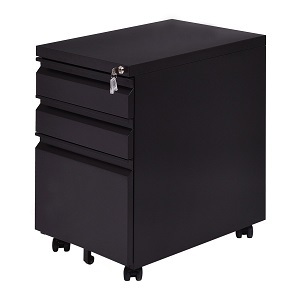 Studio Designs manages to offer their file cabinets at a very attractive price point. Yes, they are a bit on the small side but the build quality and ease of use are high enough to help make up for it. We feel that there is where including some plastic instead of metal in certain areas really pays dividends. Studio Designs file cabinet is a nice entry-level product targeted for those with small home offices and aren’t in need of a huge amount of storage space. By combining the benefits of metal and plastic, they are able to offer a very affordable product that still retains must of its toughness. You don’t have to deal with any major fitting issues and operation is smooth and simple. This is a strong choice for someone on a tight budget. The build quality of Tennsco file cabinets is very good. Nearly every example is made of high strength steel that is surprisingly thick. The drawers are also heavily layered in metal and, while it does make them a bit heavier, results in a drawer that can handle a lot of weight without concern of warping or bending. This is very important as having just one or two drawers misaligned could spell disaster as the drawers touch other drawers. I could essentially cause a chain reaction. The ball bearings that are used in the sliders are also made of premium metal and are very smooth and quiet in the application. As you might have suspected, the combination of being a very large file cabinet and also being made of thick material means that these units are very heavy. You will not only need a lot of space to properly house one but it will also take several people to easily move it. However, once set, the operation is very simple. The drawers, thanks to their awesome ball bearings, are super easy to open and close despite being rather heavy. We also have not seen any alignment issues which further help with operating the drawers. Inside, there is ample space for any sort of document that you may need to store. Tennsco has configurations for both vertical and horizontal files and also specialty cabinets that are optimized for certain types of files. Tennsco file cabinets take a very clean and professional approach. You won’t find any super modern curves or features and the color options are limited to pretty “safe” colors. However, you do still get some variety, particularly in how they structure their handles. Tennsco offers both built-in handles as well as metal handles that are mounted directly to the face of the drawer. While you may not be in love with styling to the point that you would proudly display it centerfold in your home office, Tennsco file cabinets will look right at home in any professional setting. It is no surprise that for such a large and capable lineup of product, the asking prices are going to be quite high. This company is targeted towards businesses and typically businesses will have much deeper pocketbooks than your average home office. However, for those who can and are willing to spend the money, you will receive a file cabinet that will perform much better than most lower-end examples on the market and it will pay for itself in the long run. Tennsco file cabinets are in the business of accommodating businesses more so than small home offices and their lineup has done quite well in this approach. 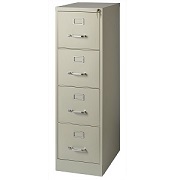 Their large file cabinets utilize thick steel construction, premium components, and proper support structure which results in something that can handle the wear and tear of a high-traffic office setting for many years. There is an abundance of storage space and more drawers than we know what to do with. However, it does come at a rather high asking price. That being said, the premium price is more than justified with the performance you get. While Z-Line Designs file cabinets are made of real wood, it is important to understand that the wood more often than not tends to be pressed wood rather than true full cuts. This is a common technique to not only reduce cost but also make things more lightweight. However, pressed wood isn’t nearly as resilient as true wood so dents and scratches are much more common here. The fitting and alignment or quite acceptable, however. We didn’t see any major issues with drawers not properly fitting and this makes opening and closing them much easier. Overall, the amount of use of a file cabinet in a home office setting is much lower than what you would find in a business setting and these products are tough enough to handle that. One important issue to note is that Z-Line Designs file cabinets require quite a bit of initial assembly. This is in stark contrast to most of the other products we have reviewed which require little to no assembly. This is another way that they were able to drive down the asking price (think IKEA) but for some, the 2 hours of assembly is not worth the cheaper price. Once assembled, they are simple to use. Despite being wood, they are still somewhat light since they are made of pressed wood and also a bit on the small side. The drawers, while typically limited to only 2, are plenty large and deep and will adequately fit folders and other documents. They also extend out plenty far, allowing for easy internal access. If you are after a classier look, Z-Line Designs is going to be right down your alley. Their wood cabinets are very attractive and will blend right in with other wood furniture you typically find in a home. All of their products utilize metal handles as well rather than having embedded grooves. But for those wanting a more modern or professional look, you will be out of luck. Given the nice external appearance of Z-Line Design file cabinets, you will likely assume that they cost a lot more than they really do. You can expect asking prices well into the budget category which competes with other low-cost metal and plastic examples. Yes, there are some shortcuts in the construction and it requires a lot of assembly, but the combination of looks and decent performance still makes it a good buy. Z-Line Designs delivers a nice array of classically styled file cabinets that are designed for small home offices or anywhere that doesn’t want to work with standard metal or plastic cabinets. The wood, while being pressed wood rather than true wood boards, is tough enough for typical low to medium-traffic applications and has the nice benefit of being more lightweight and also much cheaper. There can be some storage limitations due to size, however. Given the competitive price point, these are a good choice for small home offices. It is important to note go into purchasing something as large/expensive as a file cabinet without first figuring out your specific needs. Below, we list out a few considerations that we think you should think about and understand before you make your purchase for the best file cabinet for you. This one may be a no-brainer, but you would be amazed how many people vastly underestimate (and sometimes overestimate) how much storage space they will need. The most common file cabinets will have between 2 and 4 drawers. The sizes of those drawers can vary greatly so we recommend doing a mental checklist of what all you plan on storing to get a better idea of what size/quantity of file cabinets you will need. Also, remember that not all of the space will be taken up by just the documents. Do you have any books that need to be stored? How thick are the folders you plan on using? Do you plan on having a lot of organization tabs? Spare pens/pencils? Remember, all of these things take up additional volume! Finally, remember that increased storage volume = increased space you will need. A larger file cabinet will need a bigger area to be housed. Exceptions to this are file cabinets that are taller (either taller drawers or additional drawers) which increase storage volume while keeping the occupied floor area the same. What Sort of Items Will I Be Storing? This consideration is closely connected to the above but it is still worth mentioning on its own. This mostly refers to the orientation of the items you will be storing. Certain file cabinets are designed to store certain sized items. 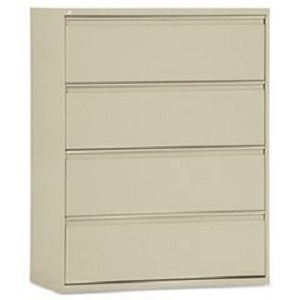 For instance, many horizontal drawer file cabinets are optimized to snugly fit typical 8.5x11” paper folders inside of them. Also, keep in mind that the actual folders will be a bit larger than 8.5x11. But what if you plan on storing 11x17”? Or larger? What about custom draft documents? Or on the opposite end, what if you work for a doctor’s office and are dealing the smaller medical cards? These are just a few of many scenarios. In some cases, there are actually file cabinets out there that are designed specifically for certain types of documents. You will see these often in the medical, architecture, and law field. If you know in advance that the documents that you need to store fall outside of the 8.5x11” norm then make sure that there isn’t a specialty file cabinet out there that will better meet your needs. What Sort of Setting Will I Be Putting The File Cabinet In? 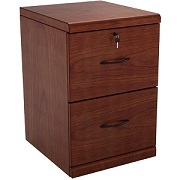 As you have likely noticed, there are a huge variety of styles and shapes of file cabinets. Some come in the generic metal form while others are in classier wood finishes and even others can come in bright colors and look like something from outer space! It is important to have a good understanding of what sort of environment you plan on putting your file cabinet in. A huge metal industrial file cabinet probably would not go well in a home office that has a plethora of aged mahogany furniture. 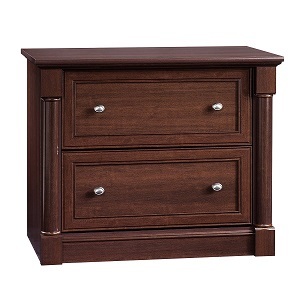 Conversely, a small wooden nightstand might stand out in a factory setting. In addition, you will typically see those file cabinets that look better in certain environments tend to perform better in those same certain environments. Large, heavy-duty file cabinets might not look as attractive but they will have features that make them better suited for heavy-duty environments such as reinforced hinges, scratch proof exteriors, etc. These are just a few of many considerations you should make before your next file cabinet purchase! Horizontal file cabinets are wider and have the files stored horizontally. These are good for busier office settings where you need greater access to more files. 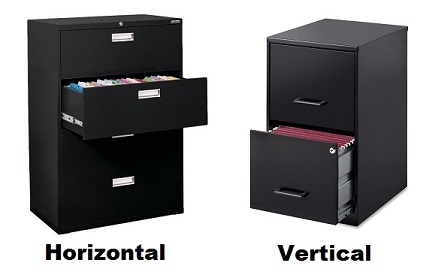 The negatives of horizontal file cabinets are that the titles on the folders are not pointed directly towards you. Vertical file cabinets are thinner and generally taller and are better for settings that don’t require as much storage space. A big benefit is that the folders that you store are pointed towards you, making them easier to read. The obvious negative is that you won’t have as much storage space. 1.5.1 How Much Storage Space Do I Need? 1.5.2 What Sort of Items Will I Be Storing? 1.5.3 What Sort of Setting Will I Be Putting The File Cabinet In?